So the end of the month has arrived and sadly, I have not completed the list. It was always a bit ambitious but I did hope I’d do rather better than I did. In the end I made 6 recipes off the list, which was good in the sense that those are six recipes that I wouldn’t otherwise have made, but a little disappointing that I never made the others, largely because most of the recipes came from recipe books that I’ve now returned to the library. To the extent that I ended up photographing the recipe for one recipe so that I could make it this evening after I’d returned the recipe book. 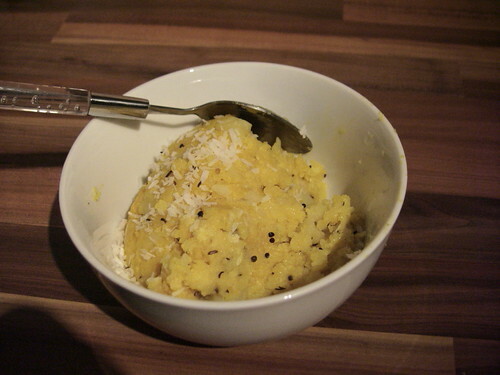 or Batate Pohe, to give it the correct name. Which was nice, very filling – proper stick to your ribs food but while many of the rice dishes in that book work as both accompaniments and as meals in their own right, this one definitely needed an accompaniment. Whether a spicy vegetable side order or perhaps just some sauce (I’ll be trying the leftovers with Plum Sauce tomorrow to test this theory) it just needs a wee something more. 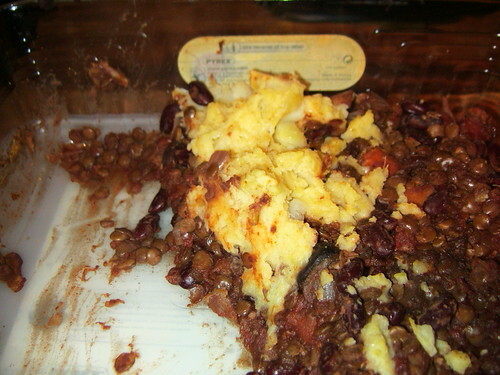 Lentil and Bean Cottage Pie. I nearly forgot to photograph this one, so you get the left-overs. I’ll pretty them up with some extra mash when I’m settle again, but I wanted to record this for posterity before I forget and never post about this one. Very tasty, I really enjoyed it and would definitely make it again, though the recipe is designed for six so I need to work out a way to more effectively cut it down. As while I successfully cut down the topping, still ended up with enough filling for six which wasn’t ideal. However, I did feed it to a carnivore who also enjoyed it so we’ll call that a win.